Details: Vergeboard in gable; window trim and crowns. Plan: Gable-Ell with one story wings in north elevation. Significance: Two-story clapboard clad structure is representative of the use of ornamental features to embellish a simple house type, gable rafters and gable top are enriched with heavy board cutouts produced with mechanized wood working equipment; their thickness stands in sharp contrast to the thickness of the surrounds with shoulders and feet and the thin cornices found on the two-over-two double-hung windows, three above and two below. Historic Features: Gable vergeboard; window trim, chimney stack on east elevation. Alterations: Third ground-floor opening is the main entrance with its projecting porch roof carefully rebuilt to simulate an original feature, projection added in 1956 toward the back on the east side does not detract from the original structure's character. Original Owner: Unknown; however, Evanston Day Nursery is listed as owner as early as December 6, 1954. Exterior Alteration Permits: 13FNCE-0171: Fence; 08AIRC-0037: Replace 2 AC units. Other Permit Information: After moved to Grant St., bldg remodeled by Bill Brubaker of Perkins and Will, front porch removed; 1956.28.03, Permit #31896 for 1-sty addi to frame 2-sty nursery moved from 1515 Wesley Ave.. size: 30'W x 65'L x 20'H, cost $10,000, ARCH: C.W. Brubaker, Plat of Survey (1956.05.04) in EHC file shows existing nursery building with proposed add. 1959.24.03, Permit #34012 for kitchen remodel on 1st floor, no structural changes. ($1,000). July 18, 1978. Application For Permit/ Permit #78-1181 to reroof ($1,500). c.1982 Tool and Toys storage shed built at back of property. 17-Apr-1991. BP#91-22907 for an addition. 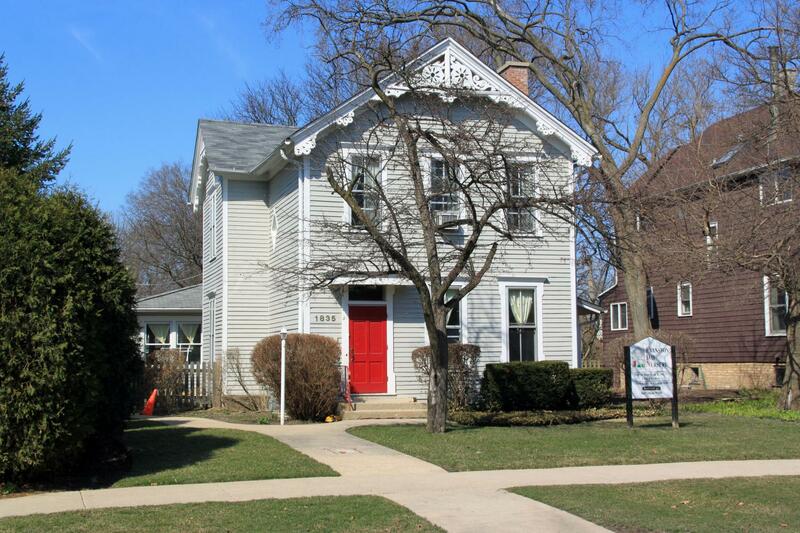 OWN: Evanston Day Nursery. ARCH Rockwell Assocs. 17-Aug-1997 (date on drawings). BP#97-36261 for a 1-story frame addition. OWN Evanston Day Nursery. ARCH: Rockwell Assocs. Set of drawings on microfiche. COA Info: 13PRES-0094: Replacing existing 4' H wd fence on the W property line at rear with new wd fence (traditional Style 6'H x 136'L); 08PRES-0211: Replace existing two existing AC units on the N side near the front of bldg with two new AC units, located at least 10' from the N property line. Historic Info: Interdepartmental Memorandum dated 1955.18.08 required the following be done to the 1515 Wesley property before it can be moved: (1) "The N gable is cut down to the slope of the adjacent main rf" and (2) "The entire 2-sty porch addition on the S side is removed." January 5, 1982. 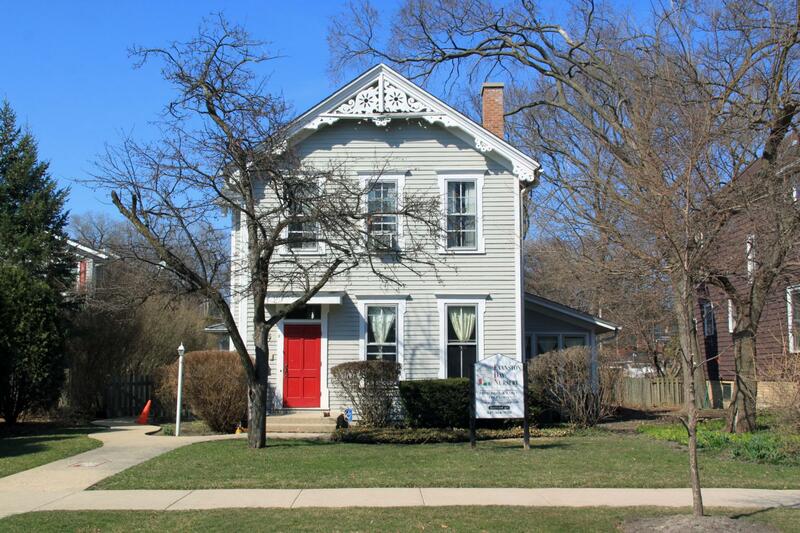 Evanston Day Nursery Association was granted a special use permit for construction of a new accessory building on the property at 1835 Grant St. No building permit on file at Evanston History Center. Source: Evanston History Center Archives (3-ring binder) STATEMENT OF SIGNIFICANCE: A7 This two-story clapboard clad structure is representative of the use of ornamental features to embellish a simple house type. The gable rafters and gable top are enriched with heavy board cutouts produced with mechanized wood working equipment. Their thickness stands in sharp contrast to the thickness of the surrounds with shoulders and feet and the thin cornices found on the two-over-two double-hung windows, three above and two below. The third ground-floor opening is the entrance, its projecting porch roof carefully rebuilt to simulate an original feature. The projection added in 1956 toward the back on the east side does not detract from the original structure's character which otherwise retains its integrity. OTHER COMMENTS: Moved in 1956 from 1515 Wesley. Remodeled by Bill Brubaker of Perkins & Will. Front porch removed.